TOKYO; Mitsubishi Heavy Industries Machine Tool Co., Ltd. (MAT), a group company of Mitsubishi Heavy Industries, Ltd. (MHI) based in Japan, is ramping up its proposals of high-precision gear manufacturing systems for the Chinese market. As part of this initiative, MAT will be showing its integrated gear machining systems at “CIMT 2019: The 16th China International Machine Tool Show” being held in Beijing from April 15 through 20. The focus of MAT’s exhibit will be the “ZE26C,” a gear grinding machine capable of suppressing final gear-tooth shape error to 1μm. The ZE26C will respond to needs for higher speed and precision especially in the transmission systems of electric vehicles and the reduction gears used in robots. This will be the first time MAT is exhibiting the ZE26C at an industry event of this kind. The ZE26C was developed to finish hardened and tempered gears with outer diameters up to 260 mm. 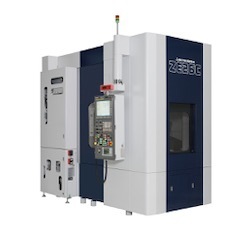 Superior performance has been achieved by making vast improvements to the “ZE-B,” MAT’s earlier series of widely acclaimed gear grinding machines. Specifically, the ZE26C’s grinding precision and stability have been enhanced by increasing the rigidity of the column, table and grinding wheel head, coupled with revamping of the spindle structure. In addition, by increasing cutting speed and reducing idle (non-cutting) time by roughly 50% compared to earlier models, the ZE26C boosts high-volume production capability and promotes lower running costs. Furthermore, by expanding the maximum wheel width to 160 mm (from 125 mm on previous models), frequency of wheel replacement is reduced and simultaneous mounting of standard and polishing grinding wheels becomes possible, resulting in higher cutting precision. Also, adoption of the industry’s first water-soluble coolant (optional) improves environmental performance while also enhancing energy savings. At CIMT 2019 MAT will also be demonstrating its “GE25A” dry-cut (i.e. requiring no cutting oil) gear hobbing machine, which is manufactured locally at Mitsubishi Heavy Industries (Changshu) Machinery Co., Ltd., a plant located in Changshu City, in China’s Jiangsu Province. Also on display will be MAT’s precision cutting tools, including new products. In this way, through actual demonstrations MAT will manifest its strength as a one-stop provider of proposal packages for applications spanning from rough machining to finishing of gears, as well as all necessary cutting tools. Today, demand for more precise gear finishing and high-volume production of precision gears is rising globally amid the shift to electric vehicles, improvements in noise and fuel performance, and moves toward low-cost production. In addition, most recently demand is expanding for robot reduction gears as development of versatile, high-performance robots gathers momentum. Within the large Chinese market too, interest is growing toward gear grinding machines capable of high-speed, high-precision finishing, and MAT’s exhibits at CIMT 2019 represent the company’s response to these trends.